I'm trying to organize my thoughts on this, but I think I liked this film (a startling first when I think about the four that preceded it). This was mainly due to Jacob. 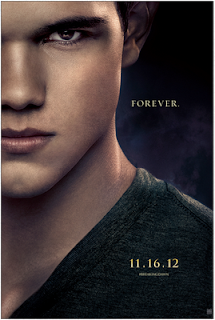 I just watched the whole "saga" in the last week or so, and I feel drawn to Jacob's story, not Bella's. His is mos def more interesting. Part of me is tempted to write a fan fic called "The Book of Jacob." Cause I'm weird/bored, but whatever. Jacob was the most interesting character in the series (who I admit, became hot in the last two films somehow. I feel gross for saying that. The dude is 20). This film brought him more to the forefront cause of that whole imprinting the baby thing, but I think he should get his own story/film. I think he's a character worth exploring. Note: I think Michelle Trachtenberg should play adult!Renessme. The final fight scene was very well done. This film has more action than the other films combined, or at least, it seems like it. I'm at a particularly vulnerable place in my life, so I have no idea if my liking this movie is in due part to my specific state of mind. But the fact remains, I did enjoy it. And if I did, I know that any kinda sorta fan of Twilight will lose their minds over it. Note #2: The CGI used on the baby was disturbing. I get it--they wanted the kid to look like Kristen Stewart, but it wasn't that serious, or worth creeping out the audience.